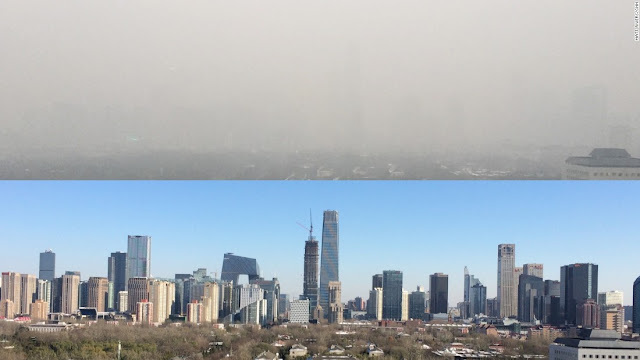 Photo (CNN) showing Beijing smog in December 2015 when the first ever red alert was issued. China's meteorological authority on Sunday upgraded its smog alert from yellow to orange, the second most serious level, after air pollution worsened in many parts of the country, including capital Beijing. Parts of Beijing, Tianjin, Hebei, Henan, Shanxi and Shaanxi will be covered with high-levels of smog for 24 hours from 8 pm today, while some regions will experience heavy pollution with visibility less than 500 meters, state-run Xinhua news agency reported, quoting the National Meteorological Centre (NMC). The NMC had issued a yellow alert for smog in the morning, expecting a cold front to help disperse the smog by tomorrow night. When the orange alert is in force, outdoor activities in schools are cancelled and construction projects suspended. Frequent outbreaks of smog have become increasingly common in winter in northern China where cold weather conditions and the burning of coal for heating combine to exacerbate the situation. In a five-year plan on environmental improvements released December 5, the State Council ordered strict controls on the consumption of coal, a major source of pollution in China. Beijing, Tianjin, Hebei, Shandong, the Pearl River and Yangtze River delta regions, and the 10 cities with the worst air quality must all see a reduction in coal consumption, according to the plan.